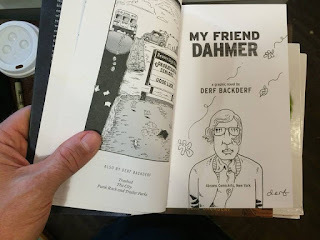 MY FRIEND DAHMER BLOG: Signed copies with original drawings! Signed copies with original drawings! Looking for signed copies of My Friend Dahmer? I've teamed up with my favorite local indie bookstore to sell copies of Trashed and My Friend Dahmer that are not only signed, but with original drawings on the title page. Hey man, I'd really love to see the film, such a cool blog, and perspective on such a famous person. It has to be so wierd to this day even, going back and reliving what you can account of your past with him, both filming on set, and seeing the feedback you've been getting for making the film. If there was any way I could get a copy, emailed, in DVD, or a link to see it streaming would be sooo coooool. Thanks for sharing. It was an interesting read. Very Nice Post And Good Job.